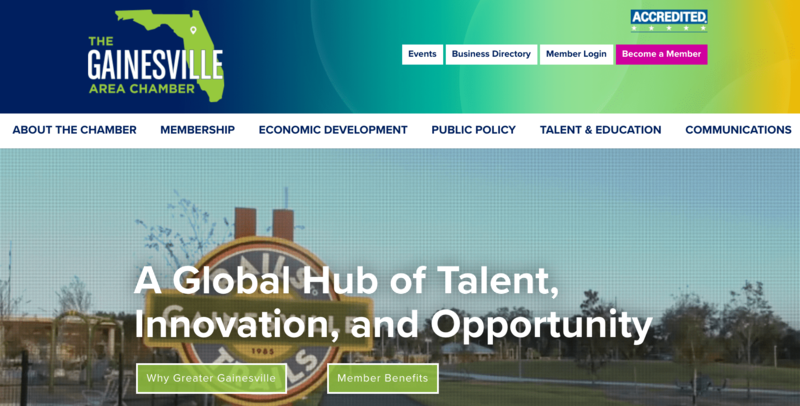 The original website focused too much on things, and did not accurately reflect the holistic, integrated offerings of the Chamber after re-incorporating economic development. The new website focuses more on people, and how the Chamber can help them. It also features more prominent calls to action. The original logo on the left had been in place for only a few years, itself having replaced a logo invoking a hurricane (also used as a symbol for a local high school sports team). It was text-heavy and busy, with colors invoking more South Beach than North Central Florida. The new logo leverages a popular abbreviation for the region (GNV), using colors that reflect the springs, warmth and greenery that surround Gainesville. It also teases out images like “heart,” “home” and even tech, one of many growing industry segments in the region. The Style Guide was distributed to team members and partners during the transition to help get everyone on the same page. It was later revised to reflect the Chamber’s new name. The launch video starts with the classic live/work/play chamber message, but then transitions to an important concept from the City of Gainesville: the idea of a “New American City.” This picks up on messaging that the city had been using recently as it unveiled its own new branding campaign, and is an opportunity to show the Chamber’s alignment with the interests of its core municipality. This was later revised to reflect the new name. This video, which also emphasizes the long heritage of the Chamber, appeared on social media and was played at the Chamber’s annual business awards event to announce the Chamber’s new name.